During Mr Rios Montt's 17-month rule in the 1980s, more than 1,700 indigenous people are thought to have been killed. The UN says it is the first time a former head of state has faced a national court for such crimes - rights activists say the trial is "historic". The former general denies the charges. The trial is expected to last months. Shortly before the start of the trial, the defence team of 86-year old was replaced. His new lawyers filed motions which could have delayed the proceedings, but were rejected by the court. Gen Rios Montt faces charges of crimes against humanity in connection with the killing of 1,771 indigenous Mayans during his rule in 1982-1983. "This is the first time, anywhere in the world, that a former head of state is being put on trial for genocide by a national tribunal," said the United Nations High Commissioner for Human Rights, Navi Pillay, in a statement. 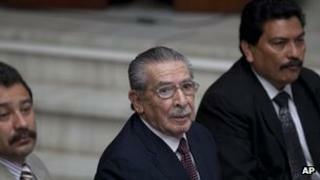 Prosecutors said Gen Rios Montt wanted to wipe out the indigenous group, which he suspected of supporting rebel fighters. The proceedings could last months, with hundreds of witnesses, since the prosecution admits there is no evidence directly linking Mr Rios Montt to the killings. Their strategy will be to use testimonies to prove that there was an established chain of command. The former general abandoned politics in 2012, after a number of mandates in Congress. He has been under house arrest since his immunity from prosecution was lifted at the end of his term. Gen Rios Montt will also face charges over the forced displacement of 29,000 indigenous Guatemalans as part of what human rights groups have called his "scorched earth" policy. An estimated 200,000 people were killed or went missing during Guatemala's 36-year civil conflict, which ended in 1996. Gen Rios Montt's 17 months in power are believed to have been one of the most violent periods of the war.